Datalogic, a global leader in the automatic data capture and process automation markets, is extremely proud to announce the new Gryphon™ I GD4500 2D scanner. Since the current Gryphon family was first launched, millions of units have been sold throughout the world, endorsing Gryphon as the market leading solution for POS scanning/data capture needs. Now the best gets even better – A higher standard has been set, achieving the world leading excellence in 2D scanning, for leaders in Retail Operations and Information Technology who wish to provide associates with the best tools to ensure a consistent, reliable and user friendly scanning experience. Gryphon GD4500 is the market leading general-purpose imager for retail application as it offers an unapparelled array of technologies that enables superior performance in an attractive, comfortable ergonomic form factor. While the Retail POS checkout is the natural environment for this product, the variety of options and its’ overall ruggedness open the doors to specific and significant applications in Manufacturing, Healthcare and Transportation & Logistics industries. 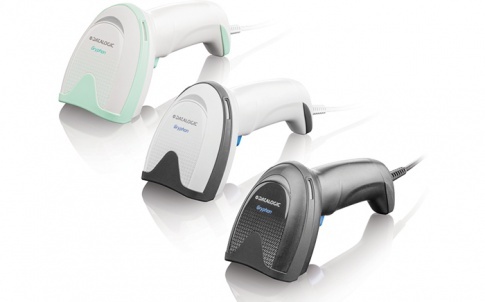 With an outstanding design, unchallenged ergonomics and a rich feature set, the Gryphon GD4500 product series from Datalogic represents the premium level of hand held scanners for general purpose applications. The dedicated optics, specifically designed and uniquely tailored for the Gryphon scanner, exploit a megapixel sensor and distinctive technology with highly visible white-illumination to achieve outstanding omnidirectional reading performance. Thanks to the increased motion tolerance, codes placed on fast-moving objects can be easily and quickly captured, creating the ideal hand held scanner for tasks requiring high throughput. A specialized model with red illumination provides the ultimate Digimarc® Barcode reading, as Digital Watermarking has become a new reality for top retailers. “With this next generation Gryphon 2D scanner you can be confident that your sales associates will easily deliver a superior customer experience. In addition to the patented Green Spot and 3GL technologies for good read feedback, Gryphon excels for the outstanding reading performance within a brand new, stylish and smaller form factor, which makes operations extremely smooth for the associates. The Datalogic highly-distinctive MotionixTM motion sensing technology realizes a seamless switch between presentation and handheld scanning. Ultimately, combining all these extremely sophisticated, highly technological features, the Gryphon GD4500 scanner represents the best performing product in its category!” stated Giulio Berzuini, General Manager Retail Industry of Datalogic. Whether in department or specialty stores, in hyper stores and supermarkets, convenience stores or groceries, the Gryphon GD4500 scanner fits most any retail in-store requirement for POS checkout. In the dedicated models with Disinfectant-Ready and Anti-Microbial enclosures, the Gryphon I GD4500 scanner is the ideal companion for Healthcare applications such as in laboratories and bedside point-of-care. The world’s leading players in the four reference industries use Datalogic products, certain of the attention to the customer and of the quality of the products that the Group has been offering for 45 years. Today Datalogic Group, headquartered in Bologna (Italy), employs approximately 2,900 staff worldwide, distributed in 30 countries, with manufacturing and repair facilities in the USA, Brazil, Italy, Slovakia, Hungary and Vietnam. In 2017 Datalogic had a turnover of 606 million Euro and invested over 55 million Euros in Research & Development, with an asset of more than 1,200 patents in multiple jurisdictions. Datalogic S.p.A. is listed in the STAR segment of the Italian Stock Exchange since 2001 as DAL.MI. More information about Datalogic can be found at www.datalogic.com.